The Harbor Light Inn is a warm and noble place to visit and stay. A different experience as memorable as the seacoast town of Marblehead itself. Located in Marblehead, one of the great sailing capitals of the world and one of the few remaining true seacoast towns along Massachusetts Bay’s North Shore, our Marblehead, MA bed and breakfast is, by comparison unique. From the soft Southwest sunsets through the small paned windows to the deep rich oriental carpets covering the mellowglow wide board pine floors, there is a warmth, a softness, a sense of serenity at the Harbor Light, much like the gentle cadence of the chimes from a mantel clock. 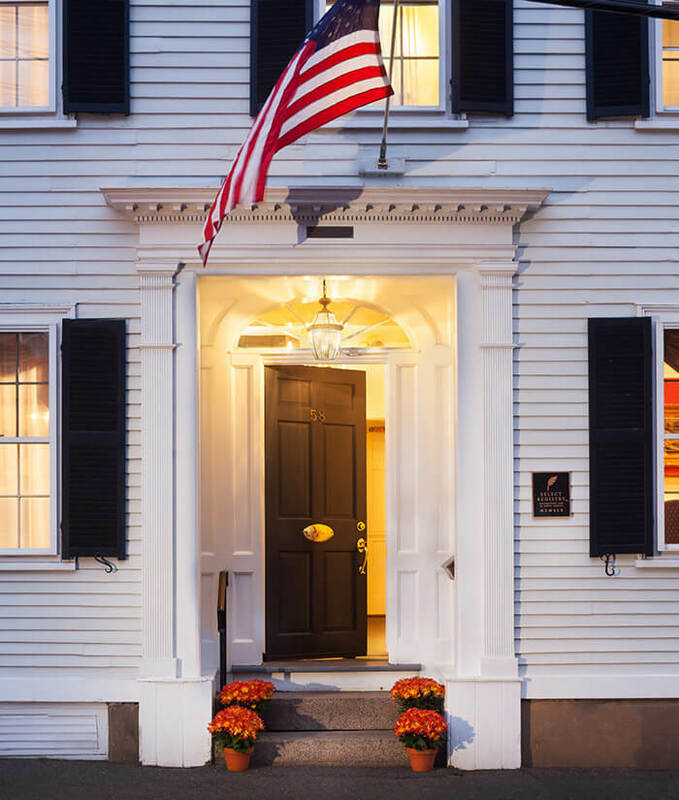 Even with all the expected amenities of any first class Boston hotel, The Harbor Light Inn has a distinct flavor and character as individual as each of its 20 guest chambers. There is, ever present, the feeling of another era: chandeliers, brasswork, hand carvings, finely tooled furnishings, paintings, etchings and prints… all reflections of the fortunes and treasures brought home from a thousand different ports and a thousand more lifetimes as sea. But it’s not the 18th century architecture nor even the fine attention to the character furnishings of each and every guest room that makes the Harbor Light Inn particular. There is something more…the atmosphere: the glow from a bedside fireplace, the honest welcome on arrival, a bountiful breakfast buffet with pool and garden view; the very real feeling that every visitor is a guest… a personal guest. 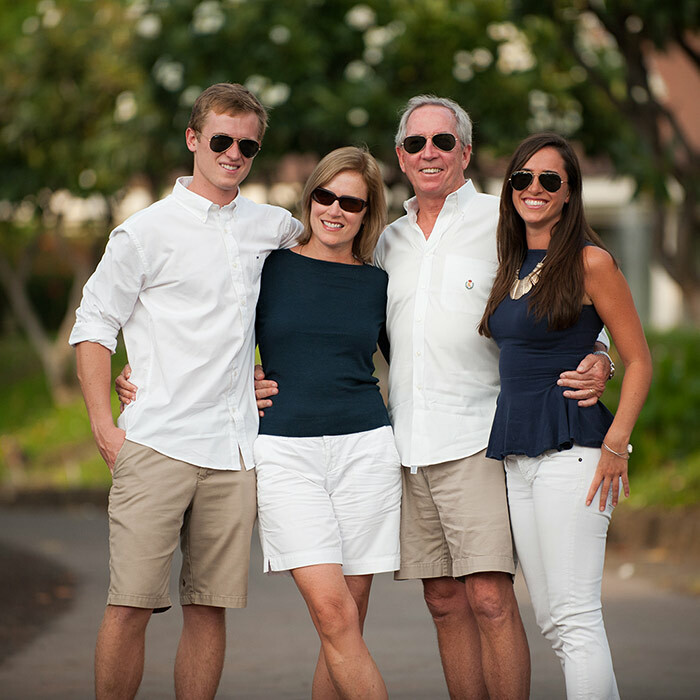 Peter & Suzanne Conway became innkeepers back in 1982 when they purchased their first inn on Nantucket Island. They purchased 58 Washington Street in 1985 and after a year of work, opened the Harbor Light Inn. Six years later they purchased the building next door, connected the two houses, and turned it into the Inn it is today! Peter’s background has been in real estate management, commercial sales and appraisals. Suzanne was a Registered Nurse in labor and delivery when she met Peter, but soon became enthralled with the hospitality business. Suzanne oversees supplying the inn and with her penchant for design, the constant redecorating of the inn. Both avid boaters, they enjoy getting out on the water whenever they can. If you need to fill some empty hours, just ask Peter about anything nautical. By 2014, they started thinking seriously about the future of the inn which is where their daughter Carolyn came into the picture. At the time, Carolyn was living (with her now husband Ben) in Maui, HI and working at the Four Seasons Resort as a Wedding Manager. Carolyn always had an idea she would end up back in Marblehead so after six years of working for Four Seasons Hotels & Resorts, she gave her notice, packed up her surfboard, and moved back to Massachusetts. Carolyn now runs the day-to-day operations of the Inn and enjoys using her 5-star training to further her family’s legacy. Harbor Light Inn is located approximately 17 miles north of Boston’s Logan International Airport, and within 8 miles East of Rts. I-95, Rt.1 and Rte. 128. Go right out of the airport onto Rt. 1A north. Take Rte. 1-A North through Revere into Lynn. Route 1A merges with Rt. 129 in Lynn. Don’t go into downtown Lynn . Stay on the coast with the ocean on your right. Take 129 into Swampscott then into Marblehead. Rt. 129 is named Atlantic Avenue in Marblehead. Follow Atlantic Ave into business district and take right onto Washington Street. Inn is approximately 1/4 mile ahead on the right. take Rte. 114 East from Danvers through Peabody and Salem into Marblehead. is just beyond Old Town House, on your right. Traveling from So. New Hampshire, take Rt. 93 S into Woburn MA then take Rt. 128 North into Peabody as above. Note: Note Routes 95 and 128 share the same road in the loop around Boston. Hartford Connecticut take 84 to Mass. Pike (Rt. 90) E. Follow this right into Boston and to Logan Airport (Ted Williams Tunnel) Rt.90 will come straight through to Logan and 1A. saving 30-45 minutes from Hartford.Then take Route 1A north to 129 East into Marblehead. South of Boston .Take Route 3 north to Boston and take Exit 20 to Logan Airport/Ted Williams Tunnel. This will pass Logan Airport and put you on Rt.1A North. Rt.90 will come straight through to Logan and 1A. saving 30-45 minutes from Hartford. Follow Atlantic Ave. into the business district and take right turn onto Washington Street. Inn is 1/4 mile ahead on the right.Washington Street. The Inn is just beyond Old Town House. We’re #58 on your right. The Inn has joined forces with Tesla to provide a charging station for all electric cars. The Tesla Charging Station provides 84 Amps of charging power. Pull up and plug into our Tesla wall connector to charge your Tesla or any electronic car during your stay at the Inn! Please let us know if you will be checking in after 10pm.